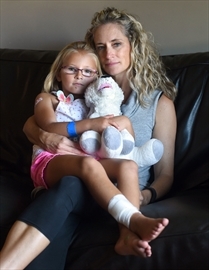 Dogs Bite Decatur Al: PRESTON, ONTARIO CANADA - A MOTHER WAS CYCLING WITH HER DAUGHTER, 5, WHEN THEY ENCOUNTERED A MAN WITH 3 LARGE DOGS - 1 LUNGED AND BIT DOWN ON THE CHILD'S LEG PULLING HER OFF HER BIKE - THE OWNER THEN TOOK HIS 3 LARGE DOGS AND FLED !!! PRESTON, ONTARIO CANADA - A MOTHER WAS CYCLING WITH HER DAUGHTER, 5, WHEN THEY ENCOUNTERED A MAN WITH 3 LARGE DOGS - 1 LUNGED AND BIT DOWN ON THE CHILD'S LEG PULLING HER OFF HER BIKE - THE OWNER THEN TOOK HIS 3 LARGE DOGS AND FLED !!! A Cambridge mother whose daughter was bitten and dragged off her bike by a dog already recognized as dangerous is outraged the dog has not yet been seized and poses a risk to the public. Michelle Hearn was cycling with her five-year-old daughter, Lauren, on the Bob McMullen trail in Preston on Sept. 9 when they crossed paths with a man standing in tall grass with his three dogs. Slightly unnerved at the size of the three dogs, Hearn and her daughter decided to pedal by without making eye contact. One of the dogs, wearing a leash but not under the control of its owner, suddenly attacked. “Just as (Lauren) got directly in front of the dog, he just growled and pounced,” Hearn told the Times. The dog grabbed the little girl by the ankle, breaking the skin in several spots, and pulled her from her bike. The owner didn’t stick around long enough to see if she was OK or take responsibility for the unprovoked attack. With no knowledge of whether the dog had been vaccinated, Hearn had little choice but to assume the animal hadn’t had its rabies shots. She rushed Lauren to Hamilton’s McMaster Hospital to undergo a “horrendous procedure of rabies shots and vaccines” over the course of nearly two weeks. 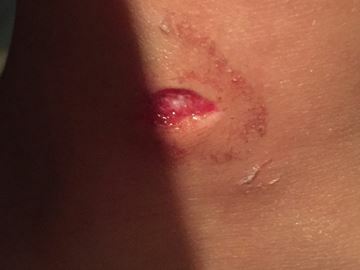 Medical officials opted not to stitch up the bite wounds in anticipation of the numerous needles the girl would have to continue to endure. It was only after conversations with local animal control services she confirmed her worst fears. Not only was the dog not vaccinated for rabies, she explained, it had already been deemed “potentially dangerous” after attacking another dog several weeks ago. “So that dog shouldn’t have even been out,” she said. Just a few days later, Hearn and her daughter spotted the same man and dogs at his home on Nelson Street in Preston, located near a section of the trail. She passed the information on to police, animal services and the Region of Waterloo Public Health – which investigates dog bite reports – in hopes something would be done. Day by day went by with little result, noted Hearn. Frustrated by the fact the dog has not been seized from its owner and by receiving conflicting information from authorities, Hearn turned to the media and social media for help. According to Cambridge and District Humane Society executive director Bonnie Deekon, the dog had been designated as “potentially dangerous”, an order that requires the dog to wear a muzzle and remain on a leash. Following the attack on the Cambridge girl Sept. 9, animal services upgraded the label to “dangerous”, a designation given to any dog that bites a human. Deekon said her officers have made repeated visits to the man’s home, but he refuses to respond. “He’s refusing come to the door when our officers go there,” said Deekon. The humane society is enacting municipal dog ownership liability laws to attempt to seize the dog, however, officers are forced to wait for City of Cambridge’s legal department to obtain a court order first. The law sees dogs as property and seizure without court approval would be akin to stealing, explained Deekon, admittedly frustrated. “The Charter of Rights and Freedoms protects all citizens from search and seizure,” she said. Deekon said the humane society, animal control and public health are doing everything they can, but said the process just takes time. For Hearn, however, that time may only create more opportunities for the dog to hurt someone else. While the investigation and legal proceedings are underway, Hearn was advised to keep her family off the popular Preston trail, something she found to be small-scale response to a big safety risk. She decided to sound the alarm herself. Meanwhile, Hearn is doing her best to support Lauren, who was traumatized by the dog attack and is now fearful of dogs. Yeah, guns are property too, but Canada has strictly regulated them. They need to get into this idiot's home, seize the pit bull type dog, put it down, and criminally charge him for disobeying the muzzle order. While they're at it, they should act preventively and seize any other pit bull types they find in the home and put them down. After all, as the pit bull crazies say "it's all the owner". If this man 'raised' one pit bull to attack children, even the pit crazies will have to admit he probably 'raised' the other ones to do the same. Down the drain with the whole bunch of them. Here's a case that includes a common feature that never makes sense to me. A dog has been designated as “potentially dangerous” and the owner has been ordered to muzzle it. Now it's been involved in another incident that occurred as a result of the owner's flagrant disregard of that order. Why is seizure of the dog not automatic at that point? I'm for seizing and executing the dog on the owner's lawn to get the point across. "Deekon said the humane society, animal control and public health are doing everything they can, but said the process just takes time." I know something that doesn't take time or processing. The laws are so ridiculous in Canada, apparently vicious dogs have more rights than little girls.